Berwick Museum’s Burrell Collection is the most important art collection in public ownership in Northumberland. With a fortune made in shipping, Sir William Burrell purchased art and objects from around the world. Most of his collection was donated to his home in Glasgow, but around 50 paintings and 300 decorative items were given to Berwick when he moved to nearby Hutton Castle. The collection features work by masters such as Degas, Boudin and Maris, ancient Roman and Venetian glass, Japanese imari pottery and Ming porcelain. 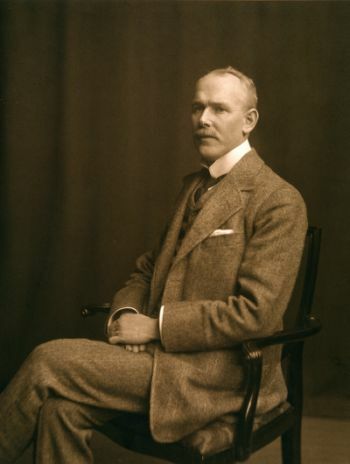 Third of nine children, William Burrell was born on 9 July 1861. His father and grandfather were involved in shipping. Burrell entered the family firm in 1875 and, on his father’s death, William and his brother took over the running of the firm. They developed the technique of ordering modern, advanced ships at rock bottom prices when the shipping market was in a slump, thus trading with brand new ships when the market recovered and then selling, at a large profit, when the market was at a peak. William also had an eye for detail and an astute eye for opportunities. Having learned that a squadron of Royal Navy ships were on a flag waving exercise in distant ports, he realised they were likely to run out of coal and sent some of his ships to one of the ports of call, selling the cargo at a handsome profit. The brothers amassed a large fortune and Burrell entered into local politics. He was active in the setting up of the Glasgow International Art Exhibition in 1901. At the age of 40 he married Constance Mitchell, daughter of another ship-owner and the following year, with the birth of a daughter, the family moved to a “Greek” Thomson designed house in Great Western Road. Having again built up a large fleet of modern vessels, the brothers sold most of them during the First World War – at more than three times the building cost. It was at this stage that Burrell effectively retired and devoted the rest of his life to being an art collector. He had a wide range of tastes but built up an important collection of Chinese ceramics, tapestries, stained glass, silver, bronzes, Persian and Indian rugs and furniture, travelling widely in the process. In 1916 he bought Hutton Castle in the Borders, although he did not move in to the castle until 1927. The same year he was knighted for his public work and services to art. He always had a good eye for a bargain – a 14th century Chines porcelain ewer was bought for 85 pounds and is now worth over 250,000 pounds. In 1944, he gave almost his entire collection to the city of Glasgow along with 250,000 to construct a building to house it. However, the terms of the bequest (he thought it should be in a rural setting) posed problems and it was not until the 1970s that a building for the Burrell Collection, in Pollok Country Park, was eventually completed. Source – Sir William Burrell (1861-1958) ‘Rampant Scotland’ www.rampantscotland.com History section. The series of audio files which are listed below contain some sound recordings from the personal recollections of local people who visited the Berwick Museum and Library when it was situated in Marygate, or those who knew Sir William Burrell and his family at Hutton Castle. The recordings are snippets taken from longer interviews which were carried in early 2015, and they are part of an Arts and Educational project on the life and times of Sir William Burrell (Heritage Lottery funded), run by Berwick Visual Arts and Berwick Museum & Art Gallery (part of Museums & Archives Northumberland). 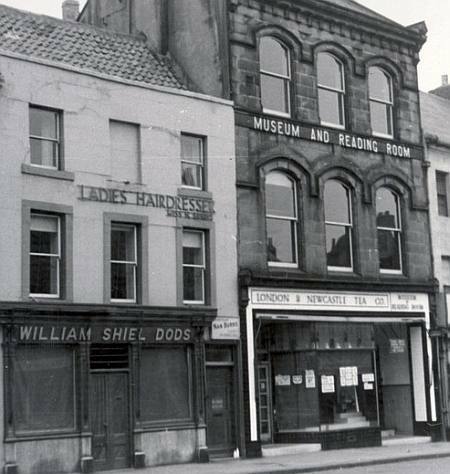 The picture to the right shows the former Berwick Museum and Reading Room at at 32 Marygate in the 1950s. Prior to its closure in the 1980s it proved to be a popular place to visit for the local community and visitors. Along with the museum and reading room it also housed the local library. Among the artefacts on display in the museum were a small number from the collection donated to the town by Sir William Burrell. The building which housed the Museum is now occupied by Costa Coffee, on the ground floor. The building shown to its left accommodated William Shiel Dods, a local family butchers, on the ground floor, and above on the first floor was Nan Burns, a ladies hairdressers. (Photograph: Berwick Record Office: BRO 1250 96 2). No 1. Berwick Museum in World War II; stuffed birds and animals, locks and keys; Burrell’s pottery and paintings; staffing and opening hours. No 2. The Museum in neglect; clocks, mineral specimens, and local history. No.3. Sir William and Lady Burrell stranded in the snow at Allanton. No.4. Collecting for charity at Hutton Castle. No.5. Marion Burrell, riding a bicycle and driving an ambulance. No.6. Employment at Hutton Castle. No.8. Burrell’s collection at Hutton Castle, and its security. No.10. The use of electricity at Hutton Castle. No.11. A valuable painting in Berwick Museum. No.13. Sir William Burrell’s enthusiasm for chess. The full versions of the recordings have been deposited with Berwick Record Office.